Happy Easter! Easter is probably THE most important holiday that Christians celebrate. It’s not about the commercialized bunny, or the eggs, although those traditions can be fun. 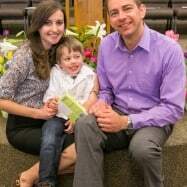 It’s so important to us that our family understands Easter is about Jesus Christ’s death, burial and resurrection through which he paid the penalty for sin so everyone who believes in Him has eternal life with Him. It’s a glorious thing and such good news! These hot cross buns help to share the story. I admit glazing skills were not optimal since I was racing to get these done. Baking with a newborn is tricky. You never know when baby will wake up and when she does, she definitely makes her demands known. Don’t worry, your buns will be cuter :). If you have any leftovers, you can cut them in half and make a really scrumptious French toast or just sauté the halves in butter on a skillet and enjoy with your morning coffee- so yum! These are sweet rolls. 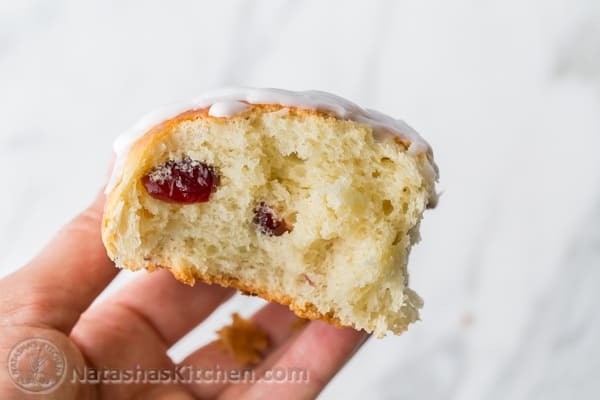 I use the basic dough recipe from my Portuguese Easter Bread, lightly spiced with cinnamon and nutmeg and studded with tangy craisins or raisins. 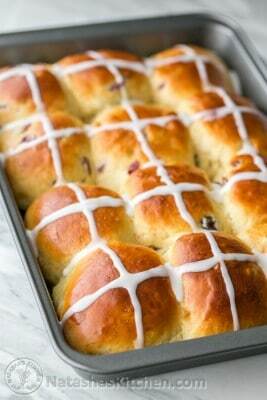 Hot Cross Buns were originally a Saxon tradition which became an Easter tradition to celebrate Good Friday. 1. In a small bowl, combine 1/2 cup raisins/craisins with 1 cup boiling hot water. Let sit 10 min then drain well and set aside. 2. 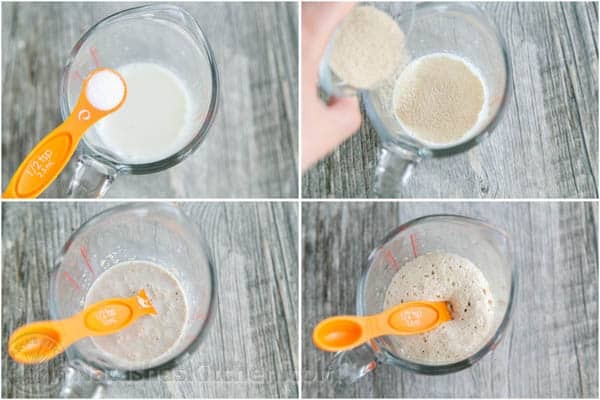 In a large measuring cup, combine 1/4 cup warm milk with 1/2 tsp sugar and sprinkle 3/4 Tbsp yeast over the top. Stir and let sit at room temp until bubbly and doubled in volume (10 min). 3. In a large mixing bowl (I use my KitchenAid mixer), combine 1/2 cup very warm milk with 1/2 cup sugar, 4 Tbsp softened butter and 1/2 tsp salt. Stir until butter is melted. Add 2 well beaten eggs and proofed yeast mixture. Stir in 1/4 tsp ground cinnamon and pinch of ground nutmeg. 4. Using the dough hook attachment mix in 3 1/2 cups flour, 1 cup at a time until soft dough forms. Knead 8-12 min on speed 2 or until smooth and elastic. Dough will still stick a little to the bowl but not to your fingers. If kneading by hand, use a wooden spoon to stir, then turn out onto a well-floured surface and knead 8-12 min using just enough flour to prevent sticking to your hands. 5. 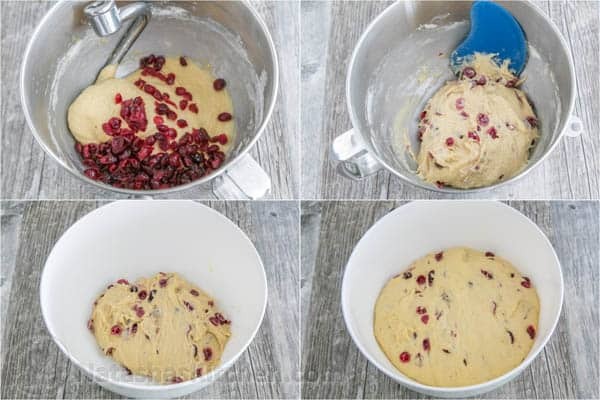 Add drained raisins/craisins (pat them dry with paper towels if they still seem too wet) and transfer dough to a large buttered bowl, turning it to bring the buttered side-up. Cover with a tea towel and let rise in a warm, draft-free room 1 1/2 hours or until doubled in volume (you can also proof in a warm 100˚F oven). 7. Now you should preheat your oven to 375˚F. Generously brush the tops with egg wash and bake for 15-17 minutes or until tops are golden brown. Remove from oven and let cool in the pan. 8. Once buns are just warm (not hot), stir together the 1/2 cup powdered sugar and about 2 1/2 tsp milk. You can add more powdered sugar to thicken it up if needed. Transfer glaze to a ziploc bag, cut off the tip of the bag and pipe a cross shape over each of the buns. Serve warm or at room temperature. 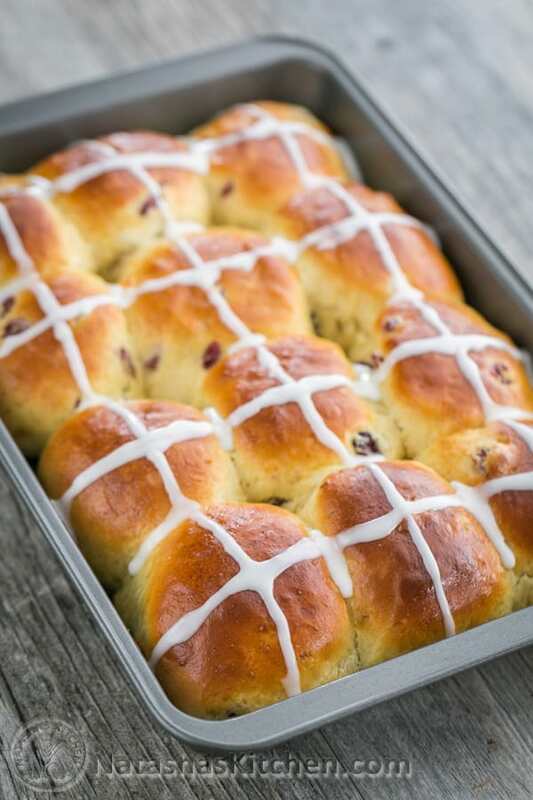 Hot Cross Buns are sweet rolls, lightly spiced with cinnamon and nutmeg and studded with tangy craisins or raisins. 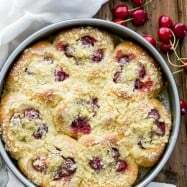 They were originally a Saxon tradition which became an Easter tradition to celebrate Good Friday.If you have any leftovers, you can cut them in half and make a really scrumptious French toast or just sauté the halves in butter on a skillet and enjoy with your morning coffee- so yum! 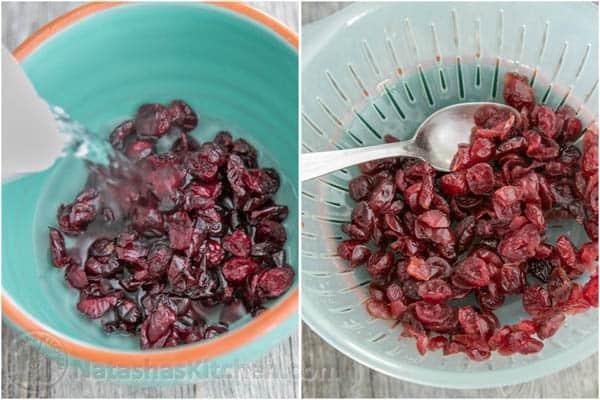 In a small bowl, combine 1/2 cup raisins/craisins with 1 cup boiling hot water. Let sit 10 min then drain well and set aside. 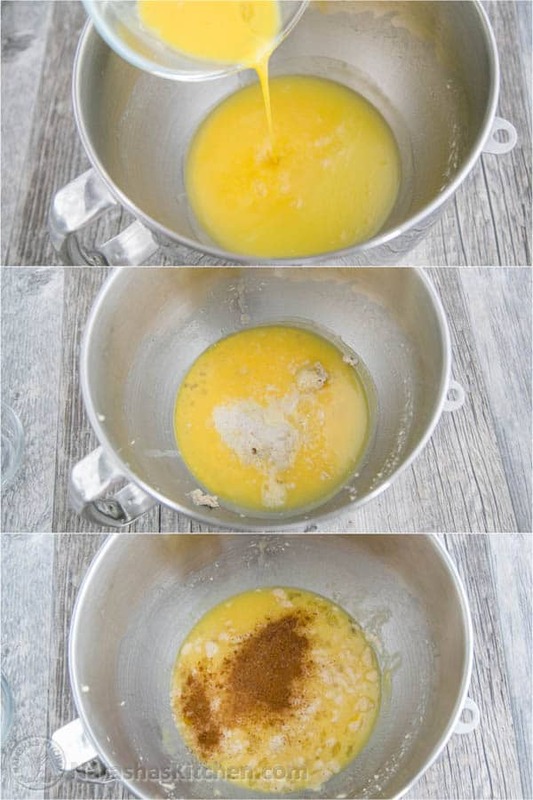 In a large measuring cup, combine 1/4 cup warm milk with 1/2 tsp sugar and sprinkle 3/4 Tbsp yeast over the top. Stir and let sit at room temp until bubbly and doubled in volume (10 min). 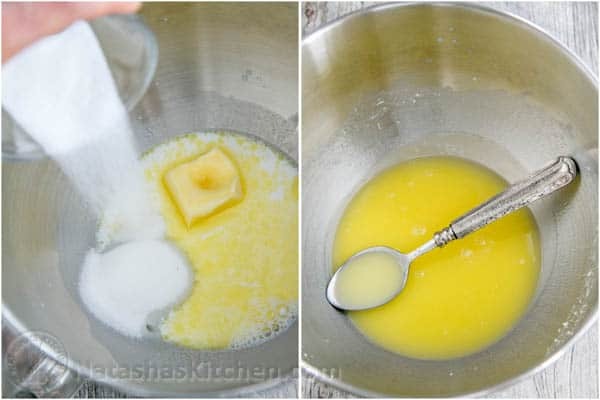 In a large mixing bowl (I use my KitchenAid mixer), combine 1/2 cup very warm milk with 1/2 cup sugar, 4 Tbsp softened butter and 1/2 tsp salt. Stir until butter is melted. Add 2 well beaten eggs and proofed yeast mixture. Stir in 1/4 tsp ground cinnamon and pinch of ground nutmeg. Using the dough hook attachment mix in 3 1/2 cups flour, 1 cup at a time until soft dough forms. Knead 8-12 min on speed 2 or until smooth and elastic. Dough will still stick a little to the bowl but not to your fingers. 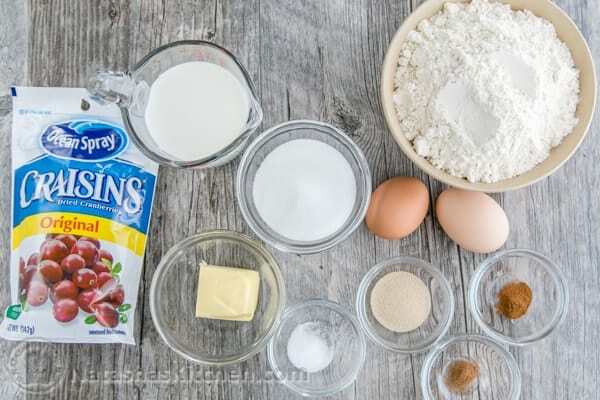 Add drained raisins/craisins (pat them dry with paper towels if they still seem too wet) and transfer dough to a large buttered bowl, turning it to bring the buttered side-up. Cover with a tea towel and let rise in a warm, draft-free room 1 1/2 hours or until doubled in volume (you can also proof in a warm 100˚F oven). Turn dough out onto a lightly floured surface and cut in half then continue cutting dough until you have 12 equal sized pieces. 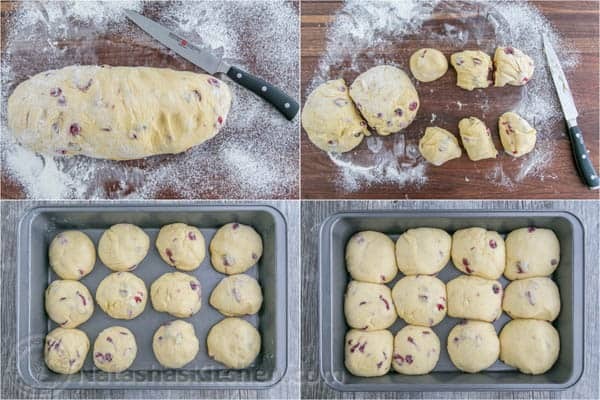 Roll dough into balls and transfer to a buttered 9x13" baking pan. Cover with a tea towel and let them sit in a warm, draft-free room 30 min until puffed. Now you should preheat your oven to 375˚F. Generously brush the tops with egg wash and bake for 15-17 minutes or until tops are golden brown. Remove from oven and let cool in the pan. Once buns are just warm (not hot), stir together the 1/2 cup powdered sugar and about 2 1/2 tsp milk. You can add more powdered sugar to thicken it up if needed. Transfer glaze to a ziploc bag, cut off the tip of the bag and pipe a cross shape over each of the buns. Serve warm or at room temperature. If kneading by hand, use a wooden spoon to stir at step 4, then turn out onto a well-floured surface and knead 8-12 min using just enough flour to prevent sticking to your hands. *I love my stacking measuring spoons – I just wash the ones I use. *These OXO stacking bowls are multi-purpose and so handy! *We sure enjoy our Wusthof knife block set. Great knives are essential. 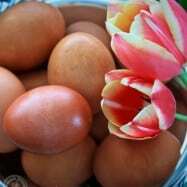 Happy Easter 2013 (A Holiday Menu and More)! Thank you! I made these buns today, for Good Friday and they turned out fabulous. 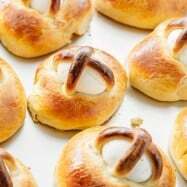 I’ve moved to a small town in India and I couldn’t find hot cross buns at any bakery here. These turned out so much better though. And such joy to see the buns rise and bake perfectly. Thank you for sharing the faith. Now I know this is the recipe I will use! I used 3 cups all purpose flour and added 2 Tbsp candied orange peel and sultanas. I also had leftover pie crust, so used those to make the crosses. My child’s class enjoyed them during snack time today and teachers messaged to say they were delicious. Im about to make the buns and will give feedback when im done. 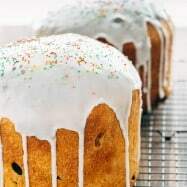 Love this recipe, so easy, have made several batches thus far and the buns are a big hit with family and friends, will def be making them again for Palm and Easter Sundays. And yes you can use lactaid free milk. but was wondering if splenda can be used to replace the 1/2 cup portion of the sugar? I am not sure because of the yeast. Hi Jeff! I’m so happy you enjoyed this recipe! We have not tested this with Splenda so I cannot advise. Is it possible that I make the dough and freeze them right away? And how do I proof the frozen dough. Can I put it inside the oven while preheating and just bake it right away? 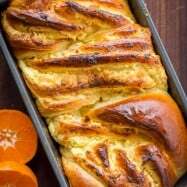 Your recipe sounds delicious, and the photos you have included on your site are a great help, however I found that I could not copy and paste your wonderful recipe to my computer. Of course, I could choose to copy your recipe because I have two computer screens, but I would not have the benefit of all your marvelous photos. My Dell computer was just professionally installed and your recipe cannot be copied and pasted. Perhaps you would consider making your website more accessible to users. 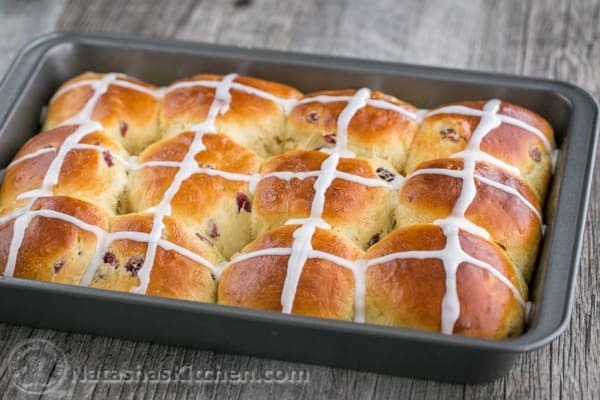 Thank you for Hot Cross Bun recipe. They were absolutely super.Brought back memories from my home country South Africa. These are perfect. Perfect! Light and so tasty. Don’t know why people critique recipes that they have changed to suit themselves. Not the same recipe anymore is it? Hi Natasha! My dough appears much thicker than yours after kneading with the dough hook. I followed amounts of ingredients quite closely, so I’m not sure what could have gone wrong. Any thoughts? Is it possible my yeast isn’t good? I just purchased it today! 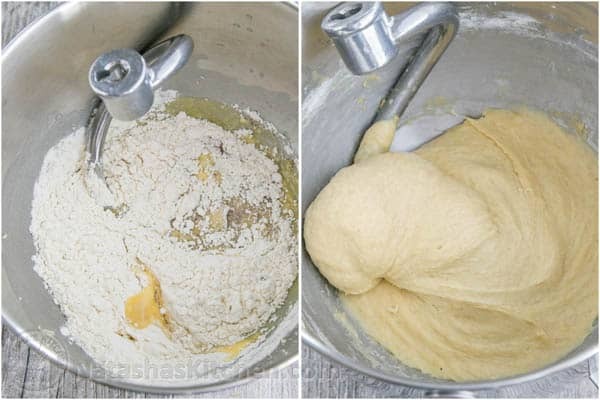 At step 4, if using the dough hook, how exactly do you knead the dough with the electric mixer? Is there a specific speed it should be on? Thank you so much. Thank you for taking the time to respond Natasha. Two double batches it will be. Have a great Easter weekend. Never think you are putting in too much details. This was my FIRST successful yeast bread recipe! Came out beautifully! I can’t thank you enough! Oh My Goodness…these are the best. I just made them and they turned out PERFECTLY!!! The only things I added were some candied fruits and tripled the amount of spice. As soon as I put the crosses on and took some photos for my IG feed, they were ALL GONE! Dough is currently proofing in the oven with 1 cup white and 2 1/2 cups whole wheat flour because its all I had in stock. I’ll let you know how they turn out. Hi Natasha, I was wondering if you knew how I could substitute the AP Flour with gluten free flour in the Hot Cross Bun recipe. Unfortunately, I am gluten intolerant and am new to baking GF. 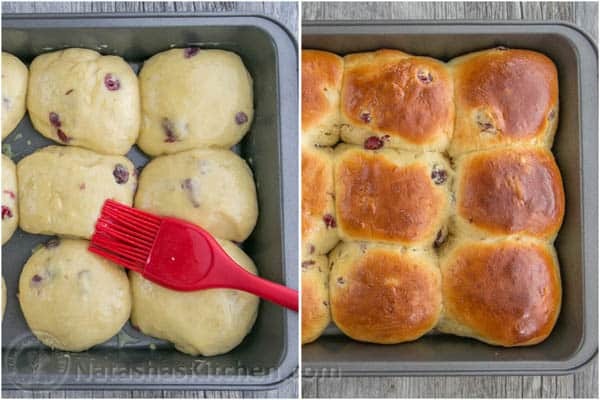 These buns are absolutely delicious! I made them and everyone is going crazy for more!!! I’d love to know if you’ve ever doubled the recipe?If so, did it yield the same great results? Also, I am planning to make lots of these for family and friends as gifts, can you please tell me if you’ve ever frozen the dough successfully and then baked? or should I bake them and then freeze them and just reheat before giving? Great buns all gone and making another batch. It is preferable to cover with a plastic film if refrigerating, rather than a tea towel unless you want the dough to dry out. That’s so great Ami! I’m so happy you all enjoyed that.